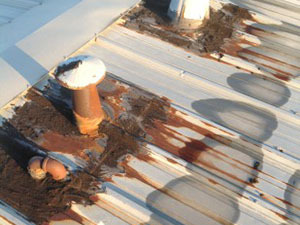 Leaky roofs are one of the most common problems we diagnose and fix at Capital Coating, Inc. As the premier full-service roofing contractor for Eastern Pennsylvania, we have more than 2 decades of experience providing a comprehensive range of preventative maintenance and inspection services – including leak detection and repair. If you have a leaky roof, chances are it’s been there for a while – it can take weeks or even months for a small leak to finally present itself in the form of a damp spot on an interior ceiling. Don’t delay – call the experts at Capital Coating, Inc. today at (717) 442-0979. Leaky roofs are often compounded by a host of other issues related to soggy roofing material and insulation. No matter how big or bad your leak is, as a full-service contractor, we can fix it. Damaged insulation – The first thing water usually comes in contact with after penetrating the roof is insulation. Insulation is very good at soaking up water, however once it does so, it can’t really be dried out and must be replaced. Not only is this an added cost, but until you replace it, you’re looking at a big jump in energy costs, as well, because wet insulation can’t do it’s job and any heat or cooled air your building used to hold is just going to pass through the ceiling and attic now. Damaged wood, drywall, and other interior materials – As the water soaks into the wood structures of the roof, it can compromise its structural integrity. Beyond that, walls and ceilings that take on water often bubble or get a dark stain – structural and cosmetic damage that must be addressed. If your building has uncoated metal structures, constant water can encourage rust and corrosion. Toxic mold – This is probably the most worrying side effect of leaky roofs. Leaky roofs are great at creating warm, moist environments, perfect for the growth of potentially toxic mold that can cause upper respiratory issues and even asthma in those exposed to it. Pests -Many insects seek out areas that are warm and wet. Leaky roofs and wet attics are prime real estate for termites, cockroaches, mice, and many other pests that can wreak havoc on your building. If you have or suspect you may have a leak, call Capital Coating, Inc. today at (717) 442-0979. 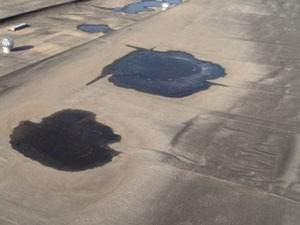 We have more than 20 years of experience finding and fixing commercial roof leaks. We also offer preventative services in the form of comprehensive roof inspections and ongoing maintenance plans. Call today for more details.